I like easy sewing projects. I really like easy sewing projects that can be completed in one naptime (I always think through my to do list in how much of a naptime each item will take). 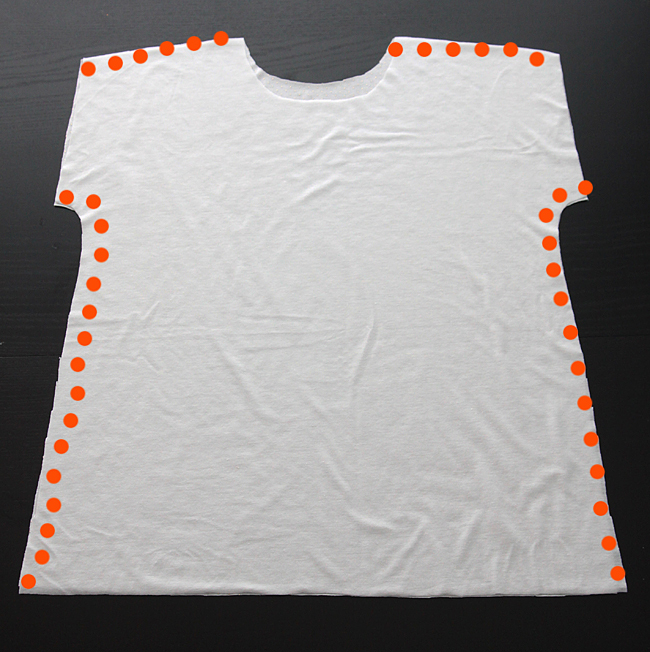 Today’s project is the easiest t-shirt I know how to make. There are no set in sleeves, just a front, back, neck band, and hem band (and yes, adding a hem band is actually easier than just hemming most stretchy fabrics). 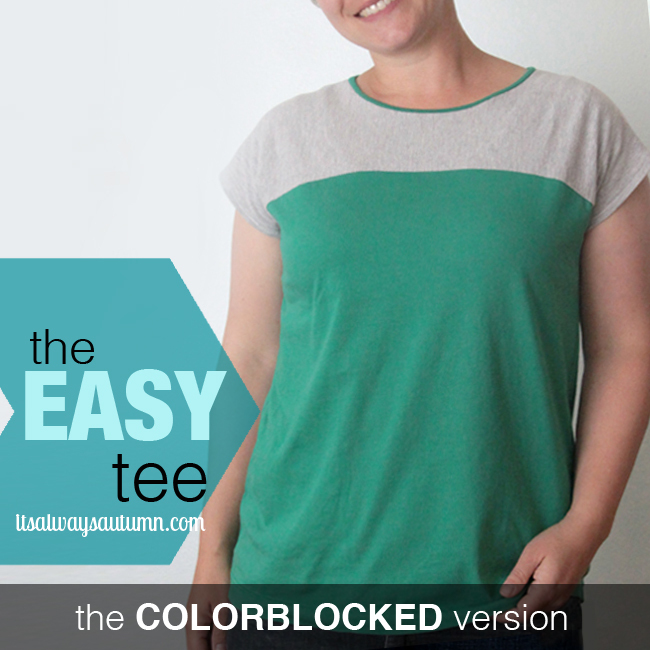 We all know by now that I also like non-muffin-top-revealing sewing projects, so this tee is cut to be roomy around the middle, but it’s very easy to customize for whatever fit you’d prefer. 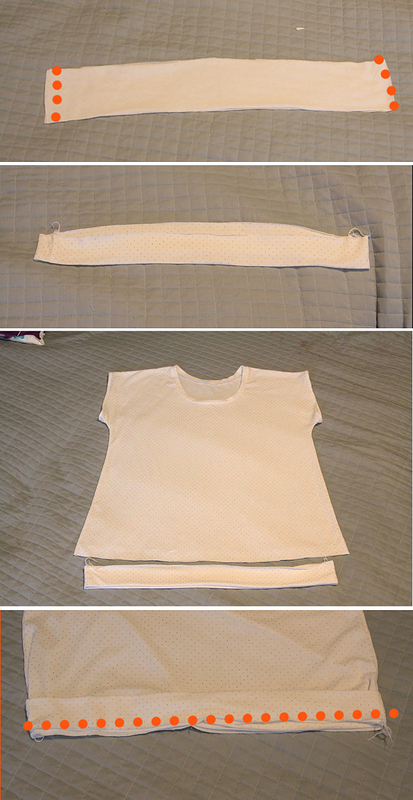 Cut your shirt pieces out of knit (stretchy) fabric. One yard will probably be plenty since knit generally comes 54 inches wide. I used this white knit with gold dots from Girl Charlee. It’s quite thin and fairly see through so I have to wear a tank underneath, which is lame, but it’s also very pretty, which is nice. Cut two of your pattern on the fold. You’ll want the neckline of your front piece to scoop down a little lower than the back piece (use your well-fitting tee as a guide here). Next you’ll want to sew the side seams. When you are sewing the curved area under the arms it’s a good idea to give the fabric a pretty good stretch as you sew, as this area will need to stretch when you’re wearing the shirt. I sewed along the curve twice as well. Press your seams open and try on your shirt. If needed, take it in on the sides or cut a lower front neckline. 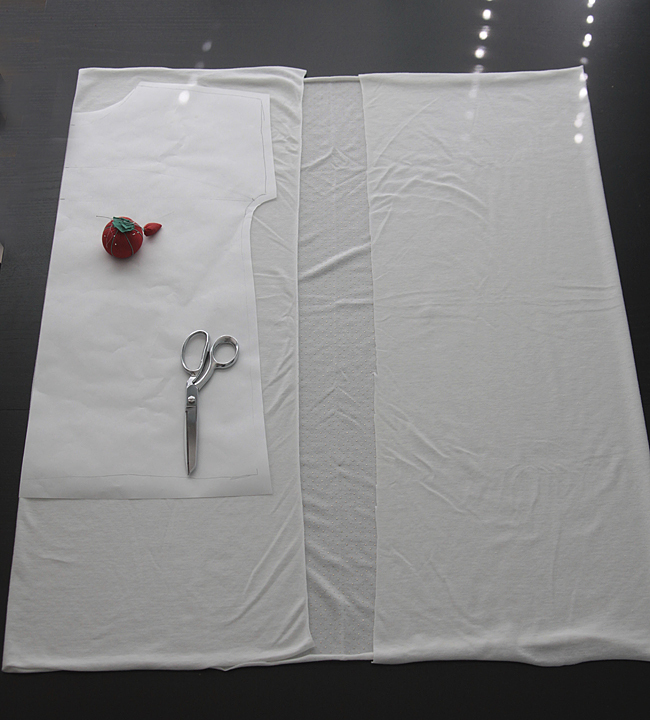 Once it fits well, hem the sleeves by turning under 1/4 inch twice and sewing with a slight zigzag or double needle. This can be tricky if your knit is very stretchy. I found I had to stabilize the armholes with a piece of paper under the fabric as I sewed in order to get a nice looking hem on the sleeves (and then I had to pick the paper out of the zigzag afterwards). Next it’s time to bind the neckline with your long rectangle piece, which we’ll call ribbing. Measure around your shirt’s neckline and subtract about 4 inches, then cut your ribbing to that length (mine ended up being 24 inches long and 1.5 inches tall). Now, if you want, you could leave the bottom edge of your shirt raw and unhemmed for a casual look. I almost wish I’d done so – I kind of like how it looks in this photo. You can also simply turn up the bottom and hem, but getting a nice looking hem can be very tricky with super stretchy fabrics (there are lots of good tutorials out there though, so if you’d prefer to just hem google hemming knits). I think it’s easiest to just finish the bottom with a hem band. Grab the last two pieces we cut out. Lay them RST and sew together along each short edge as shown. Decide if you want them hem band to hang past your hips or sit on top of them – I wanted mine to sit on my hips so I took it in a few inches. Then fold it in half lengthwise, right side out, and press. 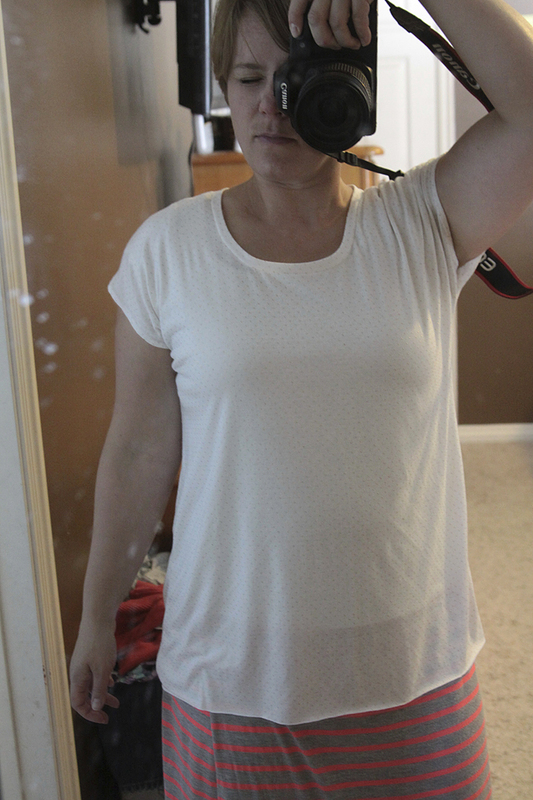 You can see in the 3rd photo here that my shirt is now wider than my hem band. 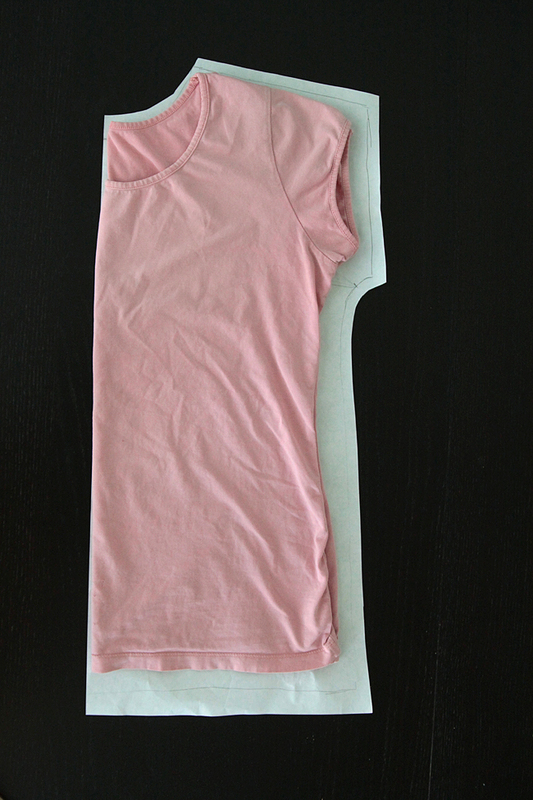 Slide the hem band up over the shirt, matching up the raw edges, and sew them together. If your shirt is wider than your hem band, like mine, you’ll need to pin it on and stretch slightly while sewing, just like you did with the neck ribbing. 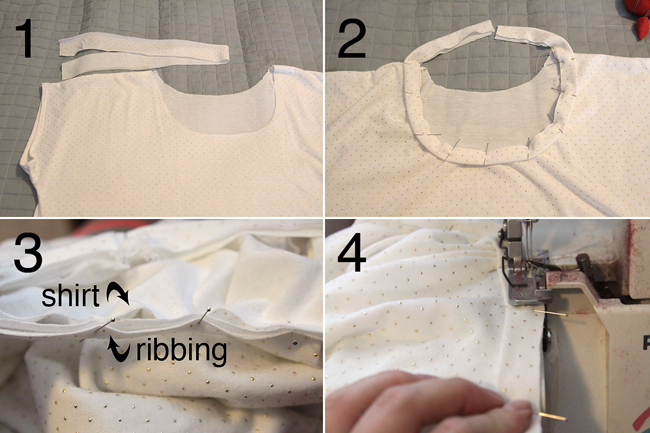 Flip the hemband down, press again, and your shirt is complete! Love it!!! I need like 10 of these. And the fabric is so so cute. Yes, please upload your pattern! Every time I try tracing around a shirt I own my new shirt comes out too small. Needless to say, my oldest daughter has a lot of shirts that were meant for me. Love that this is so easy to make – well, you make it look easy. Yes, pretty please upload the pattern, I’d certaining use it. Thnaks for sharing your talent! Your tutorial seems so simple, but I don’t sew! Soooo, can you make me a couple and send them to me? how about as an early birthday present? That would be so nice of you. You’re such a great sister. I’m the luckiest little sis ever. Oh, and I’m probably your size. And by the way, you looks so good in one of those shots of you in the shirt! Miss you! Love the tutorial and would love the pattern, pleassssssse. Thank you. Great way to make a t-shirt. I love easy to sew projects especially for summer. Also, thanks for sharing the fabric place – I found a new internet source for fabric I have never heard of. I would love to make some t-shirts. I am wondering where to look to buy knit fabric. Most places I have looked only have stiff, fleece and silky. I prefer to go to a store in person rather than online, but can do online if it is the best or only option. I have a terrible time finding nice knits at fabric stores, so I order most of my knit fabric from Girl Charlee. I too would much prefer to feel it first, but they have good prices and will send you a few swatches for free, and their selection of knits is MUCH nicer than what you’ll find at Joanns. I also use upcycled knits from thrifted men’s tees fairly often – check back on Friday for an easy tee made from thrifted t-shirts. Thanks for reading! I Love Love Love this pattern and idea!! I hot quizo ( a pub trivia game) so I end up wit ha ton of not-quite-fit-for-me tees and this is great! Thank you! Love the t shirt. I would love to have the pattern, pretty pretty. Please! Please,please may I have the larger pattern . This looks just perfect! Hi, i love your patterns !, thanks for sharing, But i have a problem, i am medium or small size, how can i fix it, width? Please tell me how I can obtain this pattern, love the cut of it. Thank you in advance. I get the way you used your own tee for the pattern, now I have to find some material and I will reply how it came out. I do have the patterns for kids. 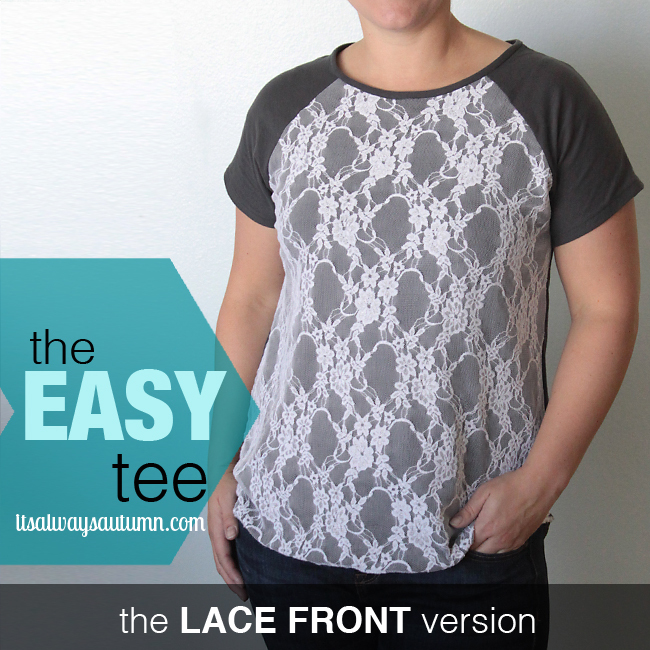 Just made my first easy tee today..I LOVE it! I see many more in the future! Thanks for sharing this great pattern!! Thank you so much for this pattern. I just stitched one up during nap time. I really appreciate you sharing all these tuts. Absolutely awesome! I am going to make about 10! Here is my shirt I made out of a woven. I didn’t get the neck trim right, but it makes a fun casual shirt. 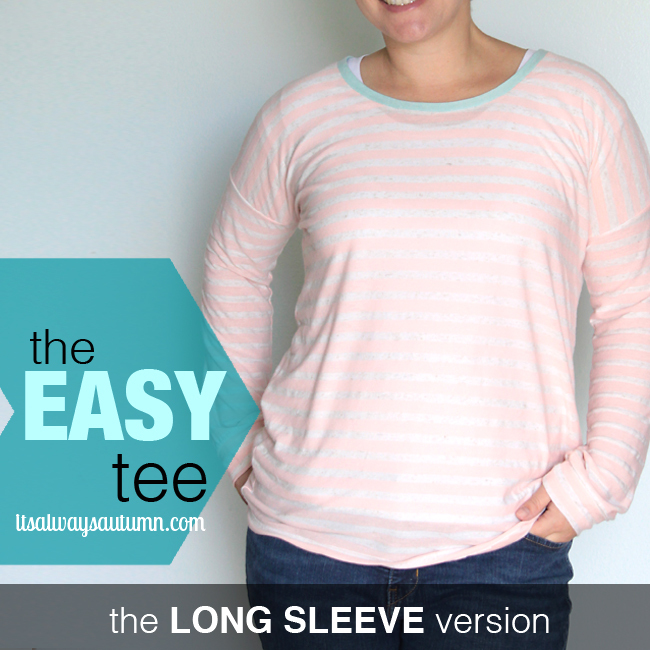 I added 1″ to the sleeve length and side widths. I also added cuffs to the sleeve. The hem is slightly lower in the back. I cut the front to the banded length and the back to the regular length. I made the slimmer version. Sorry. I can’t seem to add a picture. I just made my first shirt using your pattern and I am in LOVE! I used one of my husband’s unwanted t-shirts. I would recommend going up to a XXL to avoid including the sleeves from the original shirt. Thank you so much for sharing the pattern. It’s simply the most flattering shirt I have had on in a long time. Now I’m on the hunt for cheap thrift store shirts to makeover. You’re awesome! I love this tutorial. I’ll try to make one. Please send me this pattern. I have be looking for it for several weeks but it has not arrived yet. Love this- thanks so much for posting. 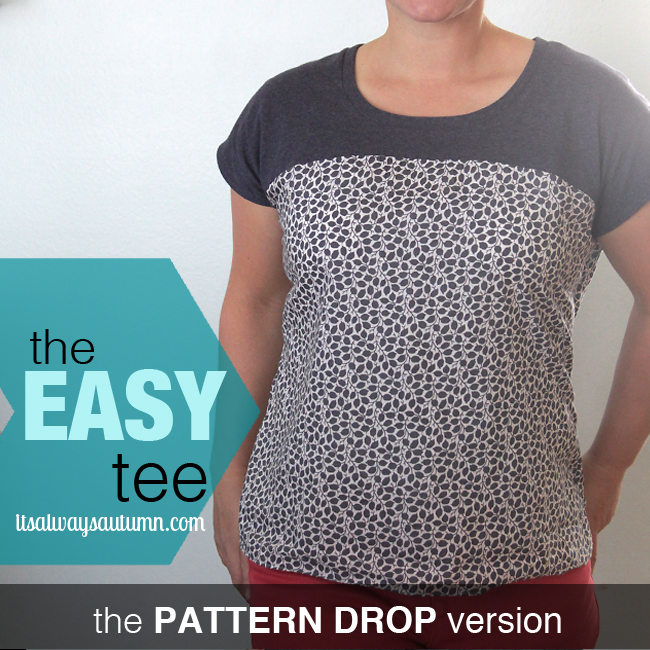 I’m buying a serger, so I needed a simple pattern that looks great and this fits the bill! Wow! so many good versions! thank you for sharing. I have a quick question: do I need a special sewing machine or any accessories to sew t-shirt fabric or is it like sewing normal fabric? Hi! I’m confused about how you do the neckline ribbing. I looks like you’re sewing it to the main body by first lining up the raw ends of the rubbing, and the raw ends of the tee/body neckline. How do you make it look like there aren’t raw ends of the fabric showing? Are sewing around the inside and outside of the ribbing so both sides stay down? Oh wait, did you stitch along the raw ends, and then flip the ribbing up, and press it to lay flat? Thanks! Sometimes I find patterns so conceptually confusing until I wrap my mind around them! Yes, you’re right! 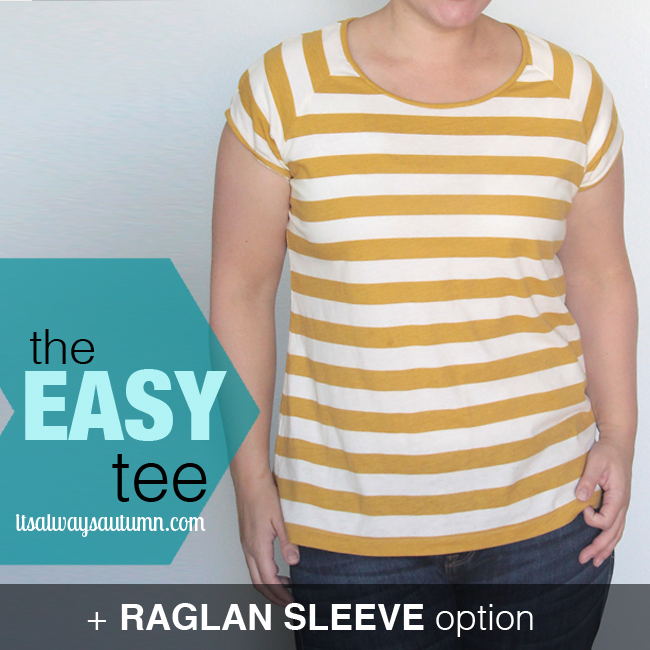 You do sew the raw edges, then flip the ribbing up and press it flat – you got it! I am confused about cutting out the ribbing. Do I cut it parallel to the body of the shirt? actually enjoyed reading it, you could be a great author. I will always bookmark your blog and definitely will come back very soon. I want to encourage one to continue your great work, have a nice evening! Hey I just loved your pattern of the collar. But I am pretty new to sewing and stitching. Is there any video tutorial which I see and follow? Cute T, Thanks for sharing. For those who have trouble with stretch fabric, they make a foot for the sewing machine that will keep the fabric from stretching while you sew. I’m a beginner for sure, but these shirts are way too cute not to try. Would you mind explaining what you mean by cutting on the stretch, like for the neckline? Thanks so much! items, all within the same category, with such items preferably not available in other stores. The actual persian elements and Asia designs with silk structure studded with rare metal and. A great hem technique for stretch fabrics is to use iron-on hem webbing which glues the hem up then twin stitch for a professional look. 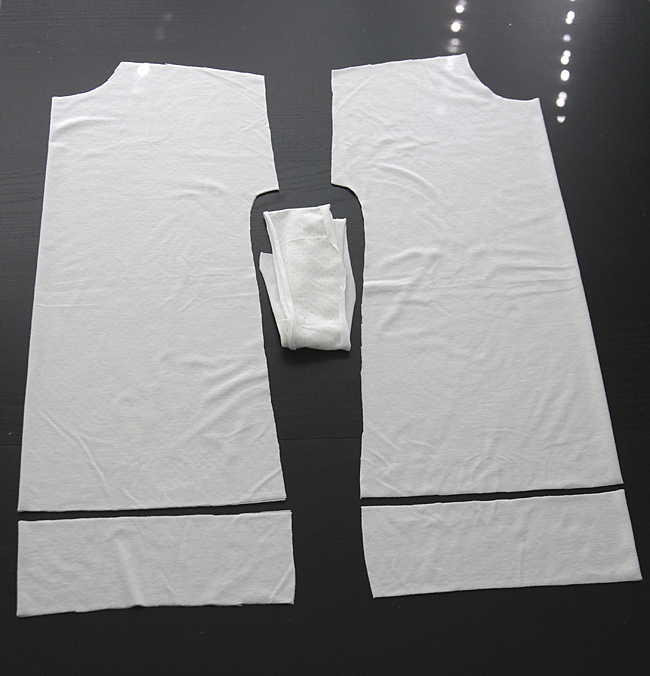 No need for overlocking or double turn up as stretch fabric does not fray. Your pattern is great! 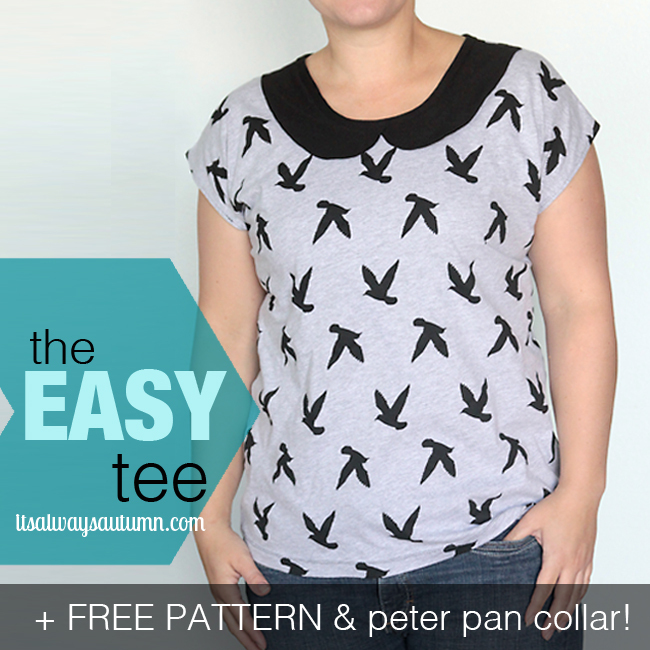 I’ve looked high and low for a t-shirt pattern that is not super fitted and not boxy, and still looks nice; this is it! Thank you for sharing!! Formerly they’re dry, bond and restrain the shirts（ED Hardy Womens Sweater ）. place where the concert is being held. the risk for switch from a motive to another. and play a responsible but fun drinking game. Thank you very much for all the wonderful t-shirt ideas and patterns! Quality posts is the key to interest the visitors to pay a quick visit the web page, that’s what this web page is providing. thanks so much for this! Love it! 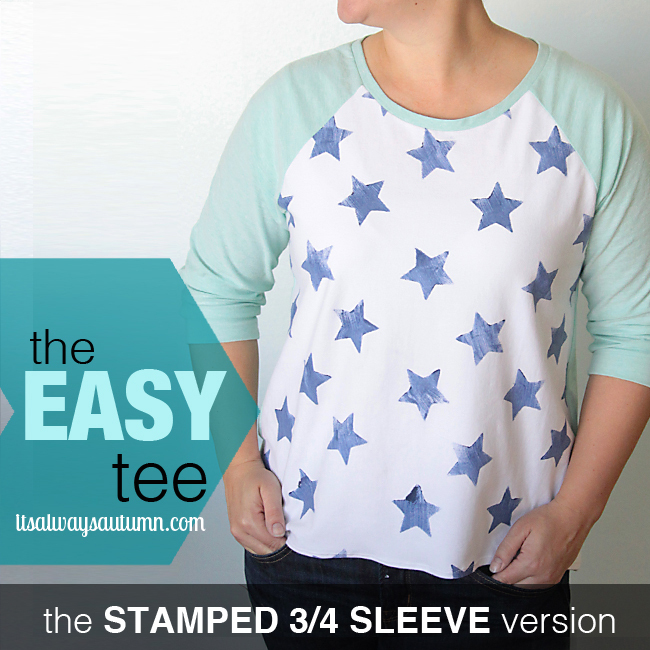 I’ve already printed out the 3/4 raglan sleeve shirt! I’ve created one of my own, but was looking for a more precise pattern and this is it! Thanks so much!!!! I’ve barely ever sewn in my life, never attempted anything other than straight lines but I just made this tee and it’s perfect! Thanks for the pattern, I’m going to be busy making lots of these!! I’m so happy I came across this tutorial – my friends and I were at Joann’s today picking up some unrelated stuff and got a gorgeous black and white Nicole Miller fabric on massive sale (5+ yards for $20!) but I had no clue what to do with it. My fiance suggested making a shirt for my mom since she’s recently lost a lot of weight and is finally having fun dressing up again, and I figure that’s better than wasting it on a buttload of pillow cases (albeit pretty, super-nice ones) or skirts for my roommate that she’d never wear. The issues here are that I’m a guy, I primarily make decor-related things or do alterations on pre-existing clothing or make fairly simple stuff (mens’ waistcoats, pajama pants, simple skirts and lava lavas are about the extent of my clothing capacities so far) and have exactly 1 experience making a ladies’ shirt. Enter Google. This is so great! Can’t wait to try them all. thanks! Thanks for sharing! Can’t wait to try it. Hi, thank you for sharing making a tshirt. I checked what a Large size is, but wanted to be sure. Could you let me know if this is correct? I would love a picture of the back so I could see what the ribbing finished looks like. Please and thank you! I really appreciate this tutorial! My favorite shirt ever is almost exactly like this! (except with a v-neck) Sadly, it is falling apart and I have been toying with the idea of trying to make a new one. Now I can do so with more confidence. Thank you SO much!!! Nicely done!! I’m living my forray into knits. T-shirts here I cone! Great post. Nicely done!! I’m living my forray into knits. T-shirts here I come! Great post. What kind of thread would you use if you didn’t have a serger? (and were sewing on a sewing machine). Thanks! Wow nice post. I like it. Thanks to sharing this post……….. 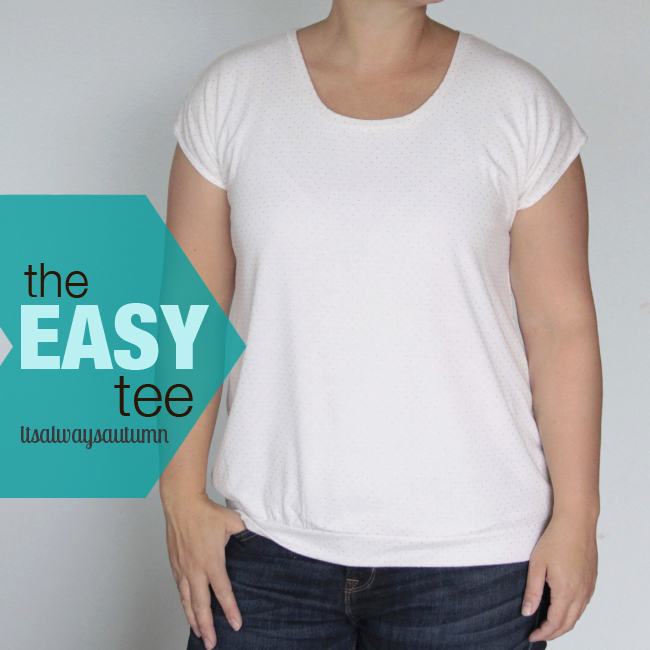 Thank you so much for the easy tee tutorial. My daughter-in-law is expecting & I think this would be adorable on her. Any suggestions to turn the pattern into maternity? I’m not an expert seamstress, so any help would be greatly appreciated!